- from reader Karen B, October 2006. We stayed here for several nights but only played in the casino for a few hours so I can't report on that. 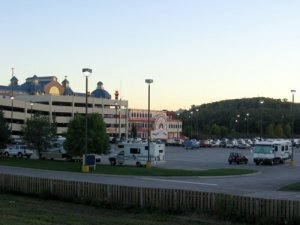 To get to the RV parking make a right after turning into the casino entrance and follow the signs. This takes you to a large parking area with easy access to the riverboat. No specific area marked for RVs. There are many other attractions besides the casinos in Council Bluffs which makes it a very interesting area to visit. Photo is taken from the levee.